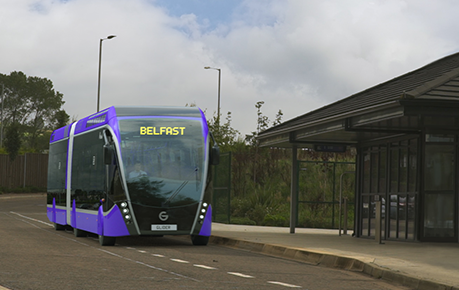 The new Belfast Glider service will come into operation during 2018 and is set to transform public transport in the city. It will offer passengers a modern, efficient public transport service with shorter, more reliable journey times and high frequency services. Glider services will operate every 7-8 minutes throughout the working day, linking East Belfast, West Belfast and Titanic Quarter via the city centre. The 18metre articulated Glider vehicles will use the latest diesel-electric hybrid engine technology delivering a smoother take off from halts, lower noise, reduced vibration and lower emissions. Each Glider vehicle will carry 105 passengers and will feature real time passenger information, audio next stop and destination announcements, CCTV, free Wi-Fi, USB charging facilities and air conditioning. 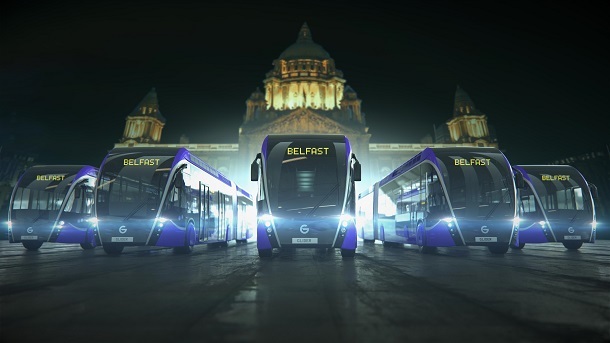 Ciarán de Búrca, Department for Infrastructure Director of Transport Projects said: “Today we see a very significant step forward for the £90m flagship Belfast Rapid Transit project, with the launch of the Glider vehicle and brand. “The new Glider vehicles, which have been specifically designed for Belfast, will start arriving in Belfast later this year. They will provide a new, modern, improved public transport experience for everyone who lives, works, socialises or visits the city. “I congratulate Van Hool on this magnificent new vehicle which I know will be a valuable asset to Belfast for many years to come”. Van Hool has supplied Exqui.City vehicles to public transport systems across Europe including Barcelona, Luxembourg, Malmo, Bergen and Metz. This order for the Exqui.City is Van Hool’s first in the UK & Ireland and the first time they have supplied a right-hand drive vehicle. The Exqui.City’s elegant design clearly distinguishes it from traditional buses. It emphasises smooth and safe travel through the modern urban environment. The use of diffused lighting and an advanced ergonomic interior are all crucial to making the trip a relaxing experience for passengers. Spacious entrances and exits, a low floor, and wide corridors throughout the vehicle secure the optimal passenger flow and make it accessible for everyone. The Glider vehicles provide easy boarding for people with reduced mobility and parents with pushchairs as well as a mix of standing and seating areas with good legroom. They have 3 sets of double doors and good circulation room to enable rapid boarding and alighting, minimising the time spent at halts and therefore reducing journey times. The Glider vehicles are also equipped with CCTV for both passenger and driver safety. • Albertbridge Road between Castlereagh Street and Newtownards Road – completed August 2017. • CITI route in the city centre and Titanic Quarter.